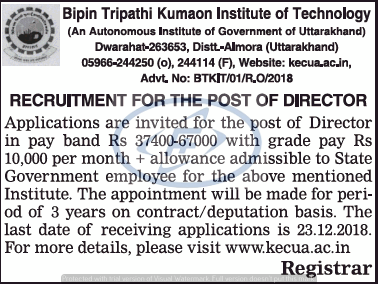 Bipin Tripathi Kumaon Institute of Technology,Dwarahat ,Uttarakhand Advertisement in Times of India Epaper Opportunities page for Faculty recruitment 2018 – Post of Director Jobs for Various Engineering departments. For More detail read full Jobs below. About Institution : BTKIT, Dwarahat which has been established in 1986 for imparting engineering education and promoting technological environment in Kumaon region.BTKIT is known for academic excellence, research contributions, executive development and industry interface worldwide. Our major strength lies in a strong team of highly qualified faculty, quality students and dedicated staff.In the fast changing global economic environment, BTKIT has strived to bring global perspective to all its programmes and activities. Latest technologies are employed for effective delivery and the curriculum emphasizes practice orientation. The Institute has encouraged an increasing overseas exposure for its students. The institute is committed to creating an ambience for nurturing innovation, creativity and excellence in our students. We strongly support interdisciplinary research and development for the benefit of Industry and Society.